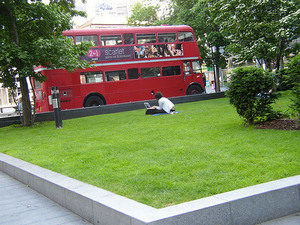 Free Wifi Network In London Will Be "Europe's Largest"
Dean Nicholas Free Wifi Network In London Will Be "Europe's Largest"
The long-heralded era of free, universal wifi in London took another step forward with the announcement this week of what will be one of Europe's largest wireless internet networks, ready in time for the Olympics. By the summer, two boroughs, Westminster and Kensington & Chelsea, will be covered by a blanket wifi zone, one that'll be free at point of use to the consumer, and the plan is to extend the network further after that. The network will be operated by O2, who will install routers and other bits of equipment on street furniture like lampposts and phone boxes, a similar approach to that taken by Nokia, who launched a system of 26 free hotspots in central London last November. After years of false promises and glitchy service, there's a sense that London is finally arriving at a free wifi panacea. Connectivity is coming to buses and Tube stations, while our wifi app has charted the best places to get online around town. Whether this will be enough to convince your boss that you'd be more productive working from the park or the pub garden is another matter entirely.